The driest place on earth? The driest state in the driest continent. So goes the South Australia Tourist Board. And over Easter, Paul and I visited some of the driest towns in that state. As a gardener, spending time in such dry regions does things to you. It plays with your emotions and sends you on a rollercoaster of highs and lows. The highs, when you see beautiful natural scenery, full of colour despite the aridness. And when you observe a seedling, seemingly growing in no soil at all; a true ‘Aussie battler’. The lows, when you witness the best gardening intentions and effort, with depressingly sombre, sparse results. Our first stop was Mintaro, a slate quarry town with a population of just 223; famous for its historic charm and picturesque 19th century buildings. We were quite smitten from the start. Admittedly it was Good Friday, but we didn’t see another soul. Well, apart from the very small dog that really didn’t want us to venture up the road it was guarding. What it lacked in size, it made up for in yappiness. Paul told me to be super brave and we eventually made it past the dog with all our limbs intact. 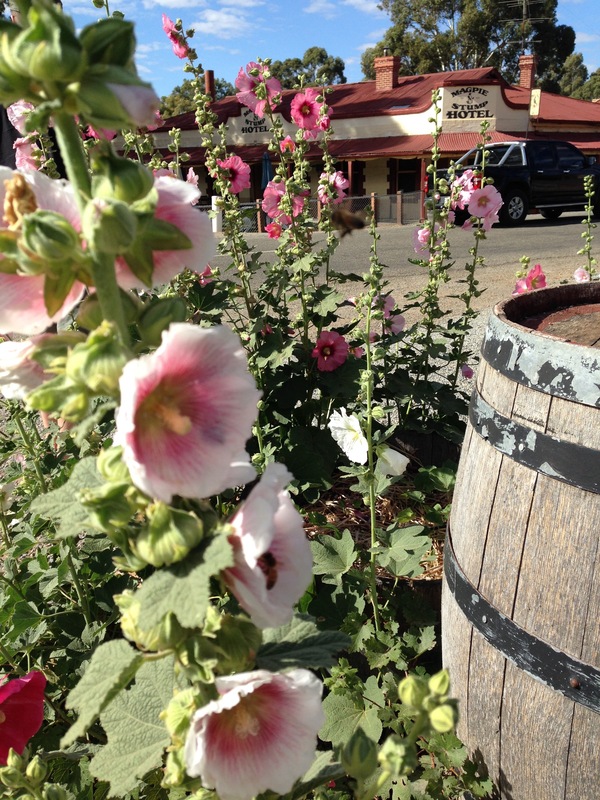 Classic Australian scene behind the hollyhocks: The ‘Magpie Stump’ Hotel with a ute parked in front! 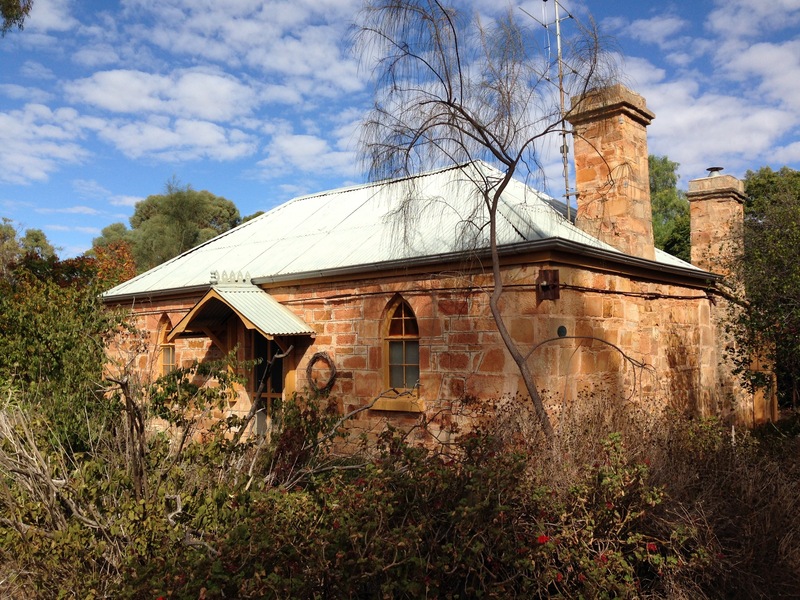 The stone work of the buildings, as across the whole of South Australia, was just stunning and we so wanted to snap up what looked like a disused cottage with an old, established garden. Unfortunately, we were forced to come to our senses when we couldn’t find a reasonable solution to the seven hour commute for Paul. I just wanted to roll my sleeves up and get stuck into rescuing this garden! 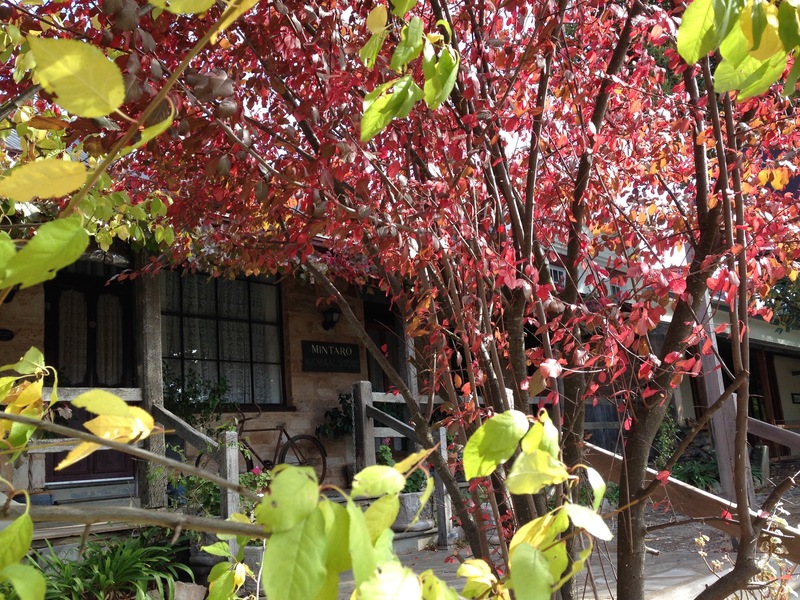 The 1854 slate quarry still operates today but tourism is an equally important industry for Mintaro’s residents. Despite the searing heat and obviously desiccated red soil, such effort had been put into its gardens, which aided the enjoyment of our visit no end. 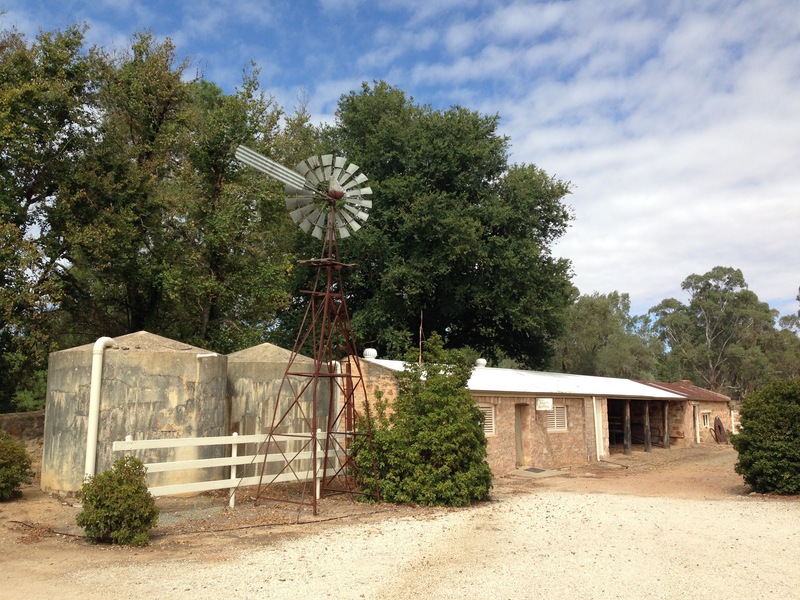 Feeling much more autumnal than when we left Sydney, we ventured on to Bungaree Station, a sheep farm set up in 1841, when the South Australian colony was just five years old. George Hawker, from Hampshire, had travelled to Australia with his two brothers and with no maps, roads or bridges, rode on horseback some 160 kilometres into the bush to find a spot to set up their new life. Bungaree comes from the Aboriginal word, ‘Bungurrie’ or ‘place of deep water’. It is quite levelling when you learn that the Hawker brothers dug through 2.5 metres of hard, dry soil, using whatever was in their packs, before finding water. I wondered how many other times they did this on their journey, to no avail. 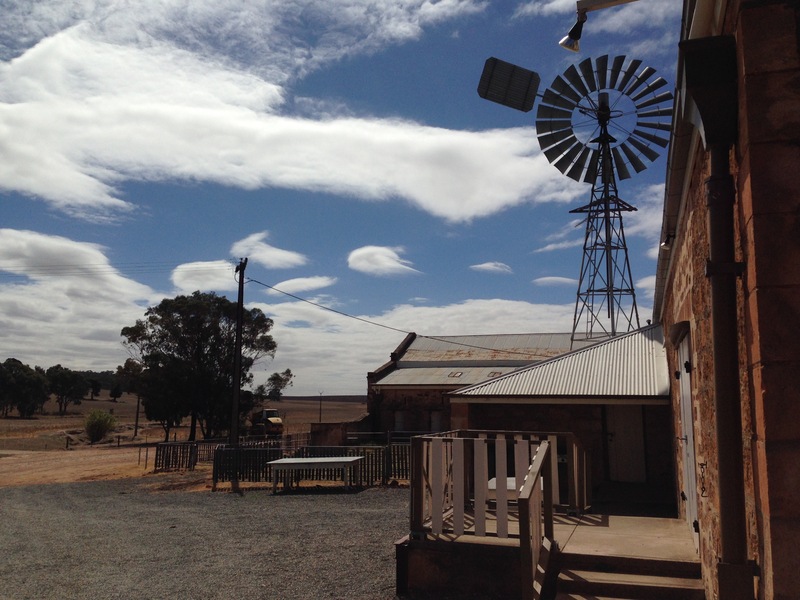 By the 1880s the station grew to employ over 50 staff and in sheep shearing season that number more than doubled. 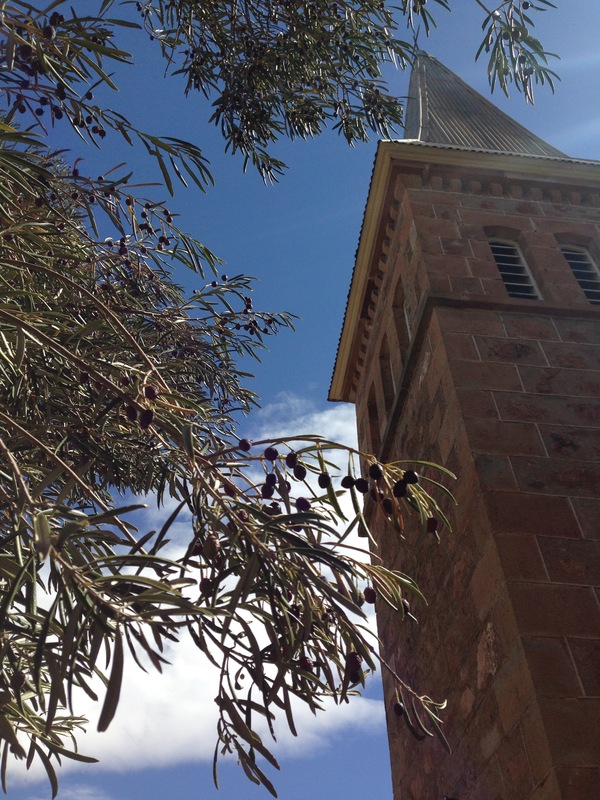 A church was built and a gardener employed for the first time. I’m not sure whether it would be soul destroying or the most satisfying job in the world, gardening here. I suppose a bit of each. Paul fell in love with the lush green lawns, such a contrast to the straw-coloured land all around. Whilst the garden wouldn’t win any prizes outright, it was heartwarming to see what could and has been done given the impossibly difficult circumstances. Roses, with flowers so delicate, often the toughest plant of all in dry climes. We completed the historical tour and it certainly was a step back in time. Quite touching to learn that the Hawker family still live and run sheep at the station, some 174 years later. I craved the simple life that I envisaged they had, free from traffic and noise and excessive distractions. Reality, of course, was that I’d be doing well to survive a month out here. 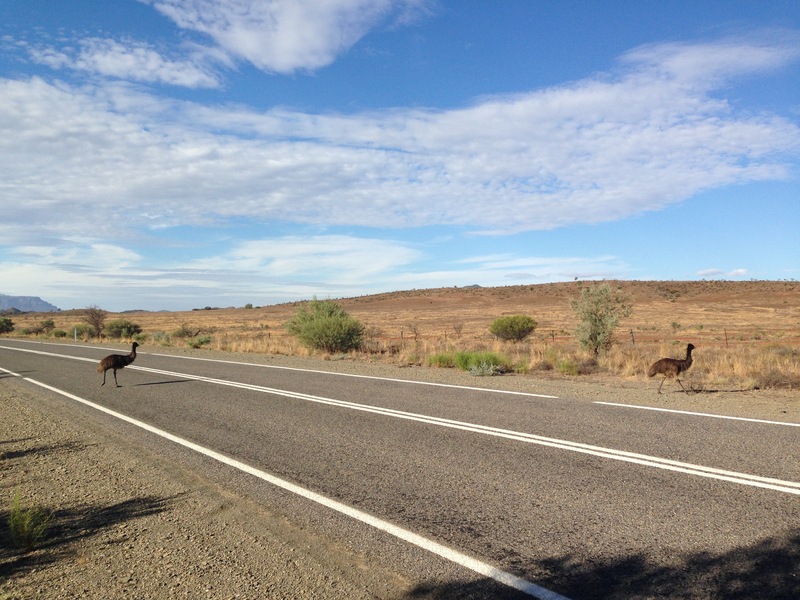 A few emus later (how bizarre is this country? 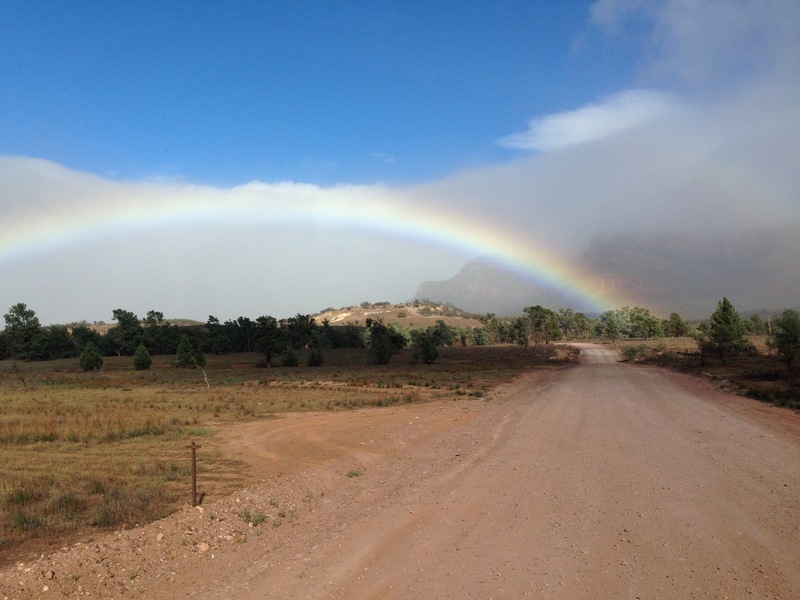 ), we arrived in the Flinders Ranges. It was the starkest scenery; it quite reminded us of our trip to the mountains of Oman. 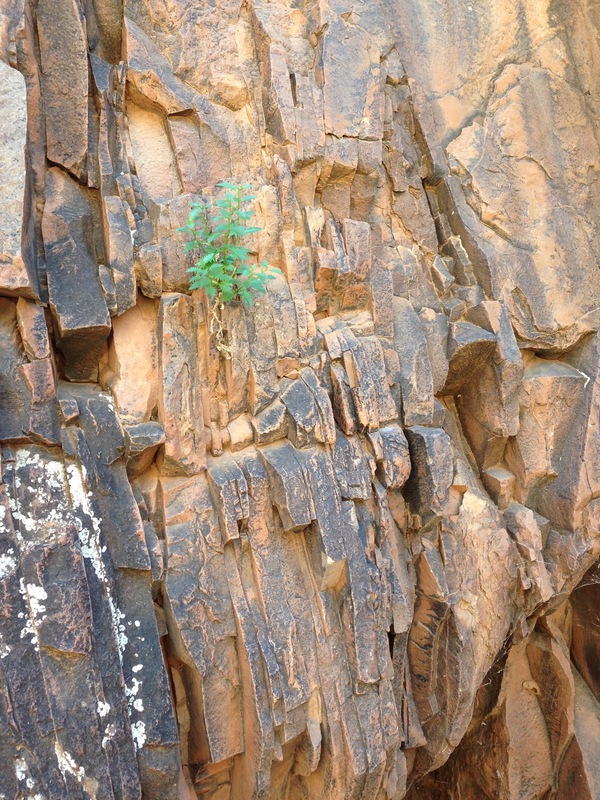 Spectacular rock formation with trees growing quite from nowhere. We walked and walked and really felt a million miles away from all civilisation. (Slightly smelly) mountain goats were our only company. The day we left it began to rain. When I say rain, it wasn’t the most dramatic rain we have ever seen. Certainly not up to Kuala Lumpur standards, but having said that, the saturation of the rainbow we saw on our drive out was more impressive, even, than the lightning of Malaysia. A few moments on and we were flagged down in the road. With just one caravan-towing car ahead of us, you do just wonder what you would do if you met a mad man along these roads. Fortunately, it turned out to be a sheep herder rather than a mad man, and not just any old sheep herder at that. Within the space of less than 60 seconds this herder moved approximately 200 sheep from one fenceless side of the road to the other fenceless side of the road with not a sheepdog in sight. It really was a sight to behold. If you’ve got a really big screen, you’ll be able to see the sheep running across the road! After the rainbow and the sheep incidence, the third curious event of our drive through nowhere was the sight of bush fires. 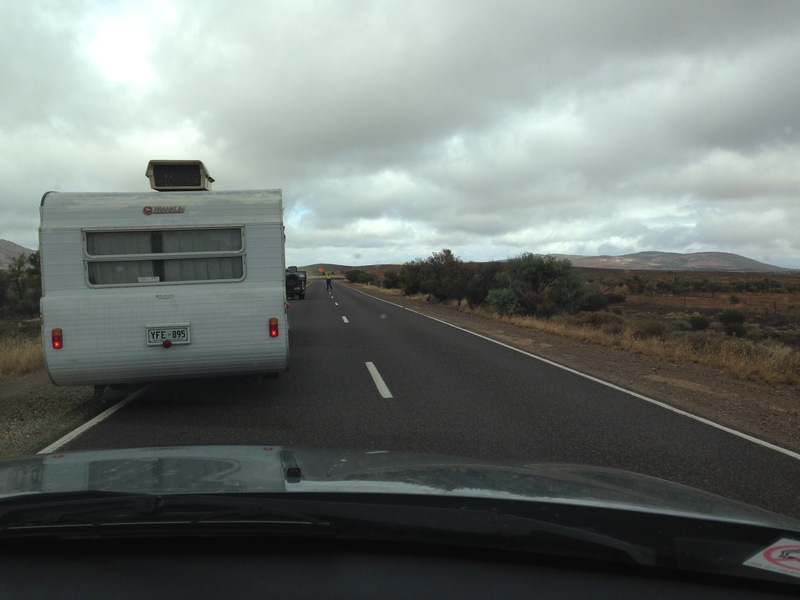 Not the most settling sight at any time but particularly unnerving for an uneducated Pom driving towards them. It got redder and redder, but as we drove through the red air, we realised it was simply dust; what was left of the top soil being lifted up and transported high into the sky and carried away. Red because the iron had oxidised through lack of water; so dry that it was simply dust; blown away because no plants secured it to the ground. How impossibly difficult to grow anything. Such harsh land. 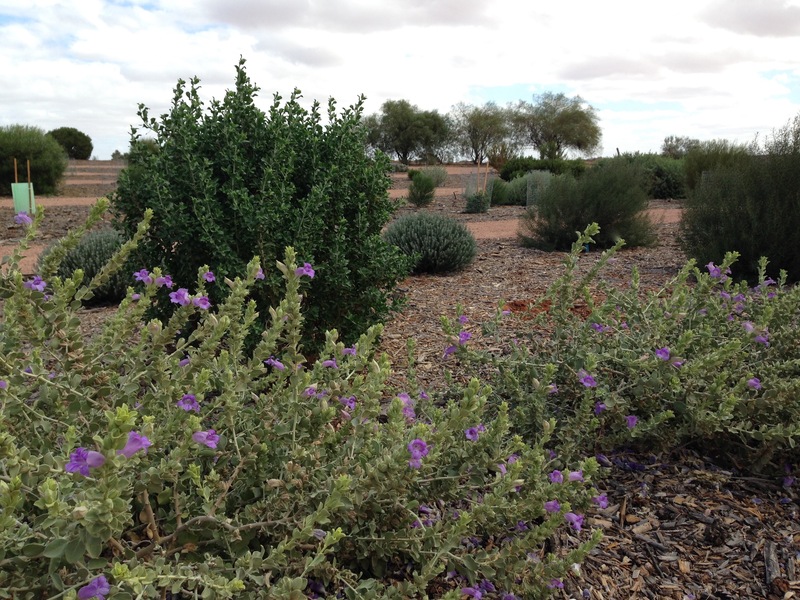 Our final destination before heading back to Adelaide was the Australian Arid Lands Botanic Garden; the number one attraction, hosting the number one restaurant, in Port Augusta, according to TripAdvisor. Even Paul was excited. We arrived in cold, damp, dreary weather without so much as a coat, poncho or umbrella between us. But that wasn’t going to put us off. However, as we started to explore the gardens and ventured towards the main areas, it gradually dawned on me that there were no more ‘main areas’. The sparse, dull, half dead areas we had seen so far were the gardens. Oh gosh. Paul told me it was ‘pretty good, actually’. I didn’t mince my words with my reply. They had spent all this money having six courtyard gardens professionally designed and they were not just uninspiring, they actually made me feel deeply saddened. Paul tried again, to explain that the entire venture was probably pretty new; all around us the plants were still growing and filling out…as we walked past a sign proudly stated that the gardens were created in 1993. This was the best that Port Augusta had to offer. An empty (on Easter Monday) garden; empty of visitors and largely empty of plants. It was cold, it was wet and I couldn’t quite believe what I was seeing. We went inside for a very early lunch. There were a couple of families inside. Kids eating ‘hot chips’; parents drinking coffee and shouting at the kids for anything and everything. Oh my. It was another world. I looked out at the bleak gardens in front of the bleak landscape and wondered how on earth these people got through each day. Fortunately, lunch solves many problems. We had an absolutely delicious hot chicken salad and I snuck in a hot chocolate to make sure I properly warmed up. With food inside me and warmed fingers and toes, I remembered that this is not what Port Augusta looks like 364 days of the year. With the perpetual blue sky in hiding, it was an unusual view in front of us. 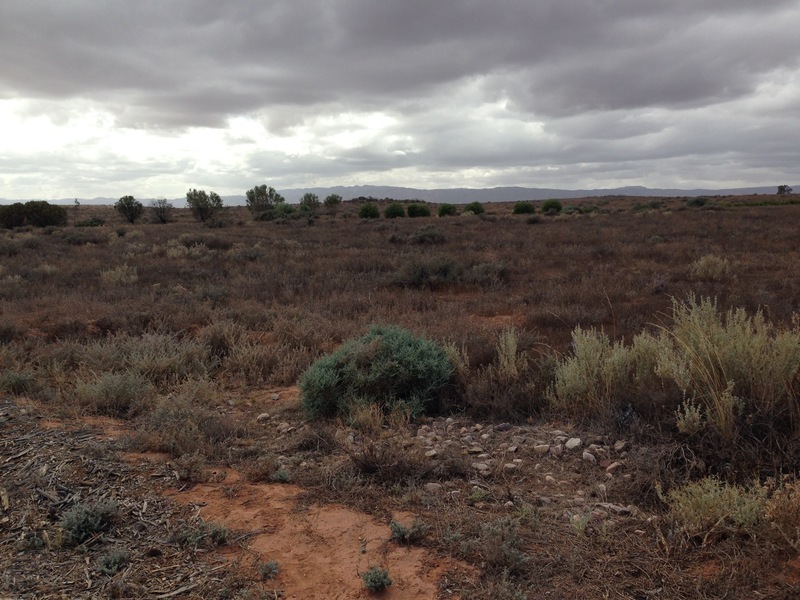 Indeed I have driven through Port Augusta before and remembered that deep blue of the sky, the very Australian ochre of the soil and the perfectly balanced grey green of the salt bushes. In fact I was so entranced I even wrote a blog on its beauty. We went out for another walk and I managed to see the highlights without the lowlights; to take photos at angles that obscured the bare soil and captured the flowers that brightened up a dull day. 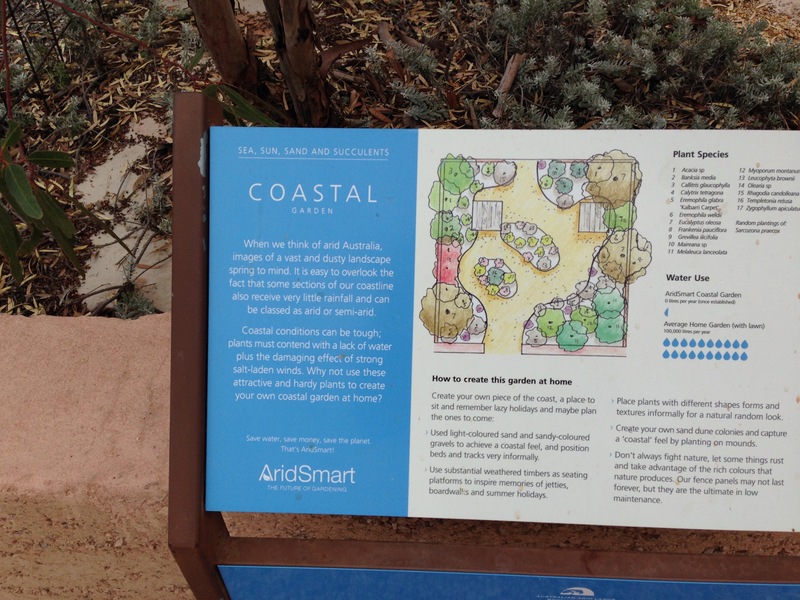 I realised that I was seeing state of the art gardening, pushing the boundaries of what had been done before and I needed to celebrate both what had been achieved here and the fact that this wet day was itself a huge blessing for Port Augusta. Oh, the irony of the Arid Lands Botanic Garden, as we stood there getting soaked! 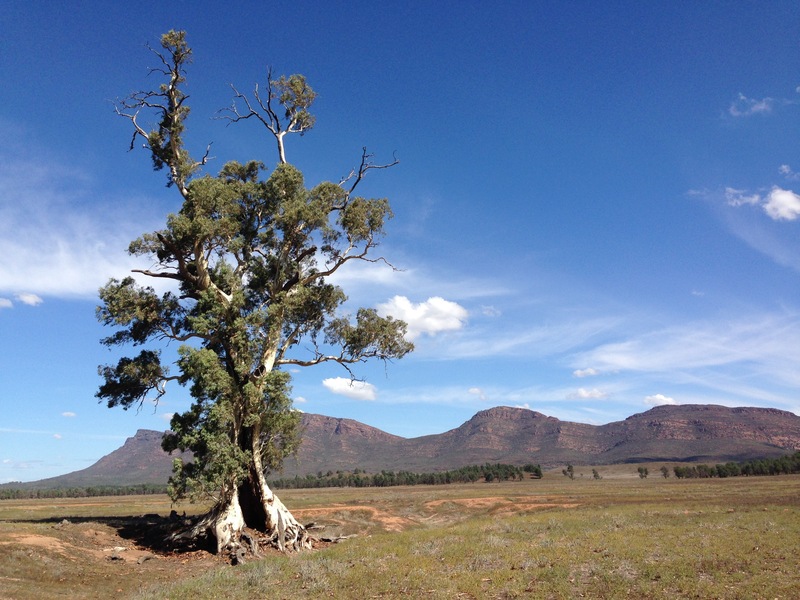 The Flinders Ranges were truly beautiful, in their rugged, remote, untouched way. 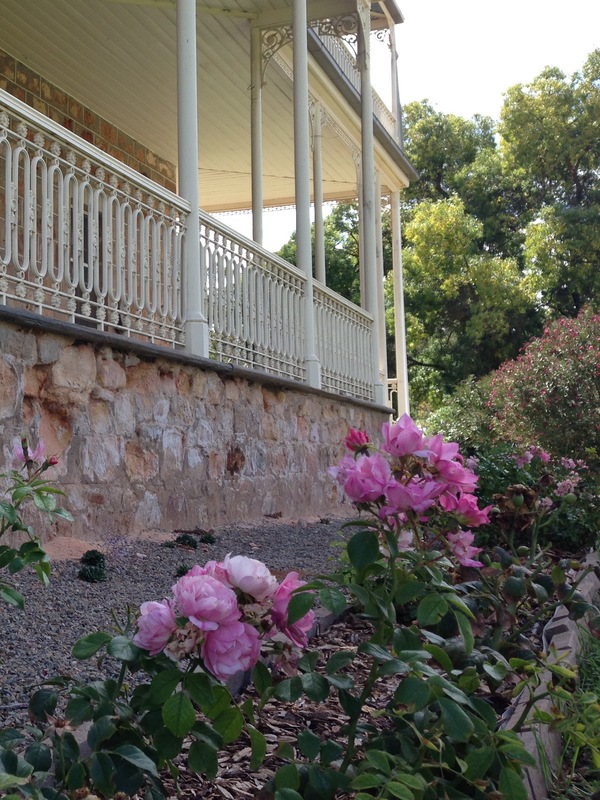 But the gardens I saw, in Mintaro, Bungaree and Port Augusta were the part of the trip that I will never forget. I realised how much I need green things around me, and how lucky I am to have them. And I realised how wonderful plants are to adapt and battle on, regardless of the harshest conditions. It also very much reminded me of the affinity I have with Australia and how lucky I am to live and explore here. 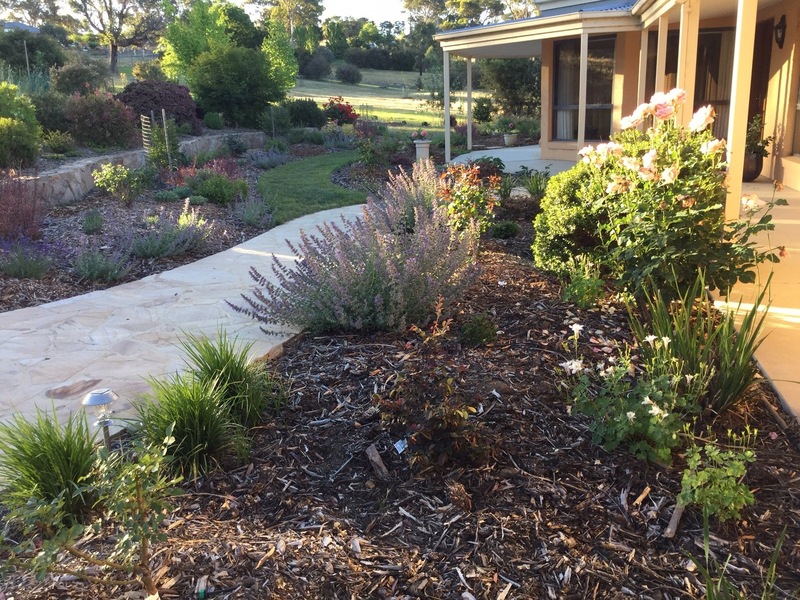 Seeing the struggles faced by South Australian gardeners reminded me to never complain about watering the garden again, as I grow my Gardenia and Hydrangea in the sandy soil of this dry country with my endless supply of water. These plants are my two loves, my two extravagances, but I feel more at ease with the drought hardy plants that fill most of my garden. Trips like these remind you of the magical things in life, that we so often take for granted. 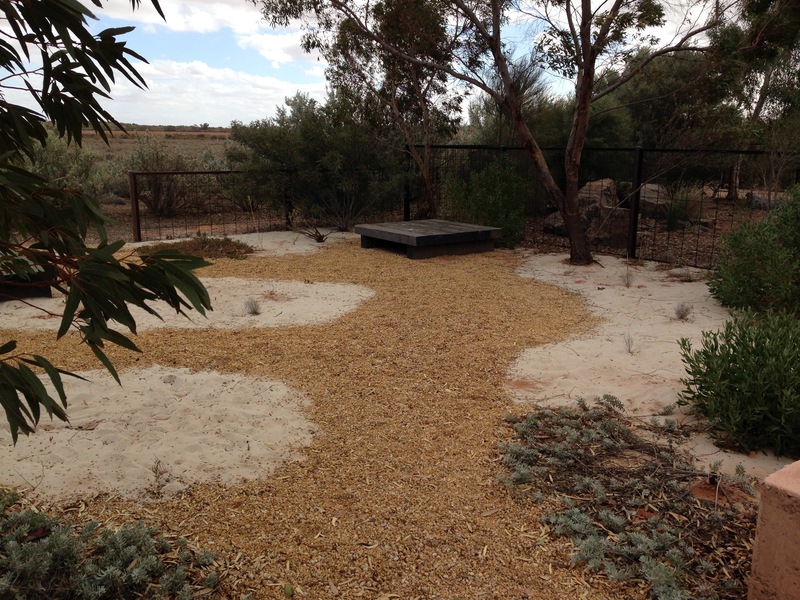 I salute all you (real) arid lands gardeners out there, with your 222mm of annual rainfall. What do I know about dry gardening? What an interesting blog Janna – I went there many years ago (to SA) so I can sympathise with your thoughts. 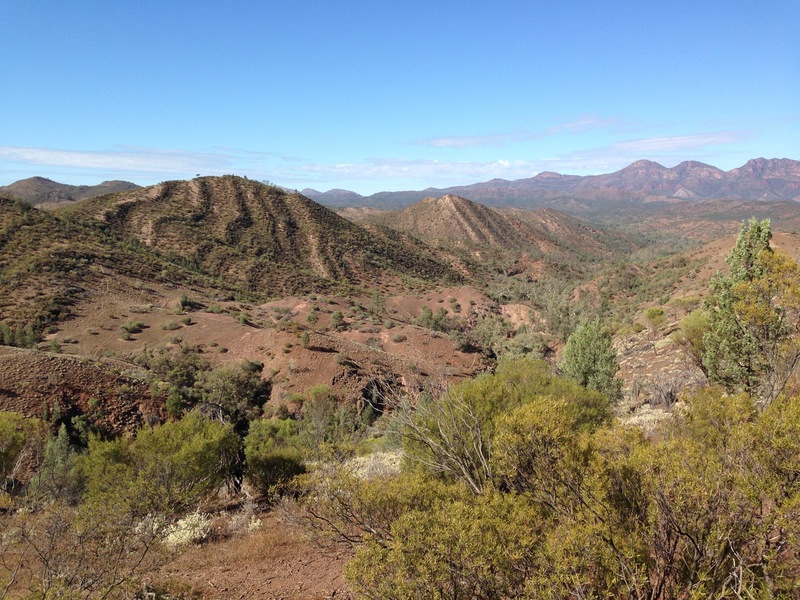 The Flinders Ranges is stunning nevertheless. They are doing remarkable things there in dry SA though, considering the harshest of climates. 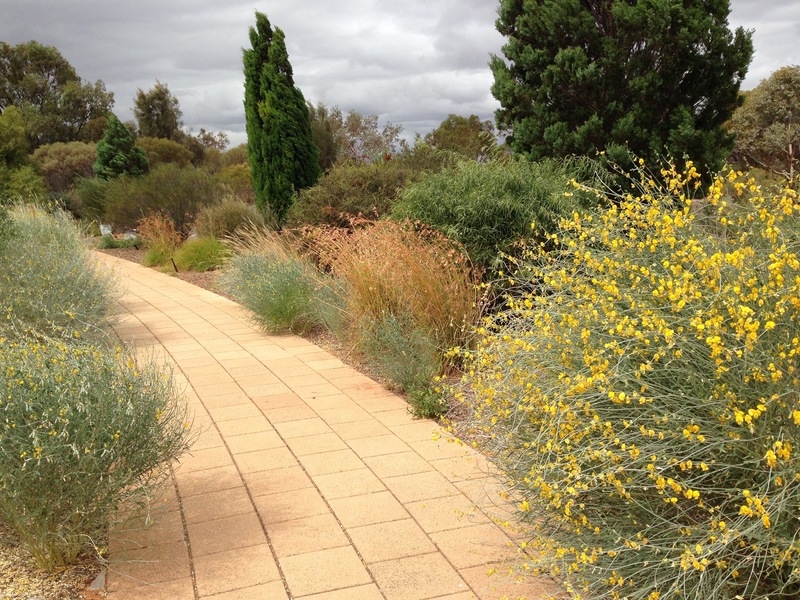 Next time go and see the Adelaide hills and their gardens (if you haven’t already done so) and you may see a complete contrast. 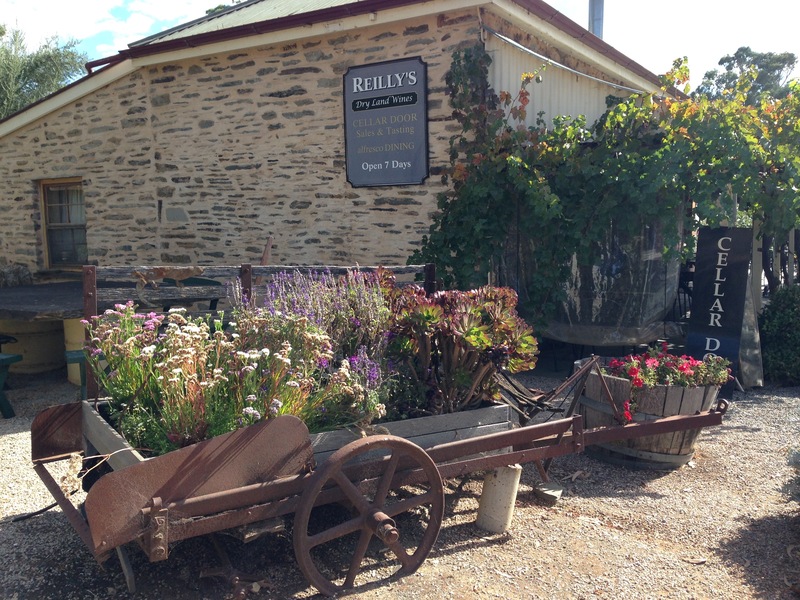 We did go to the Adelaide Hills…kind of. It was eight degrees and us silly, coatless, Sydneysiders lasted all of about 30 seconds before diving back into the car. 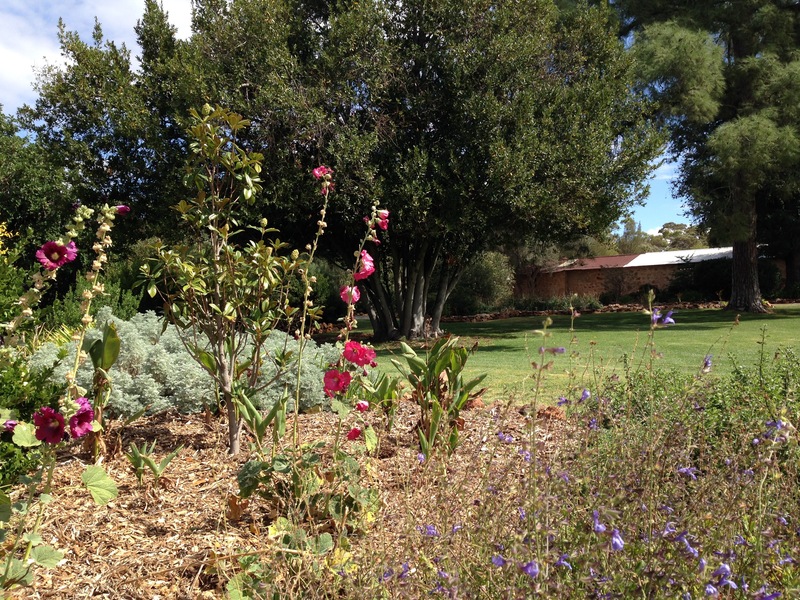 We did manage to shiver around the (marginally warmer) Adelaide Botanic Gardens, which I loved. I just ran out of space to include that here. Will share photos/thoughts of it separately, although still have so many Hidden and MIFGS gardens on the list to share too! I can relate to your falling in love with those lovely stone (abandoned) cottages too and my trip through that part was more than 40 years ago – so not a lot has changed except perhaps for more crumbling? The abandoned cottage I had in mind to renovate was the one I also wanted to sort the garden out at. However, knowing you, you had in mind one of those middle of nowhere, one solitary wall and a pile of bricks abandoned cottages! So much more venturesome than me. 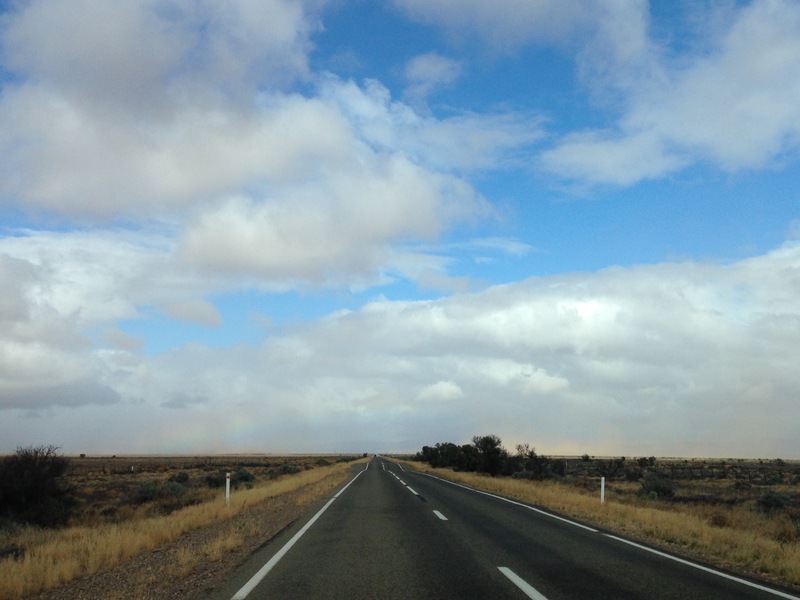 Thanks for sharing your journey Janna – yes, mixed emotions always in the outback. 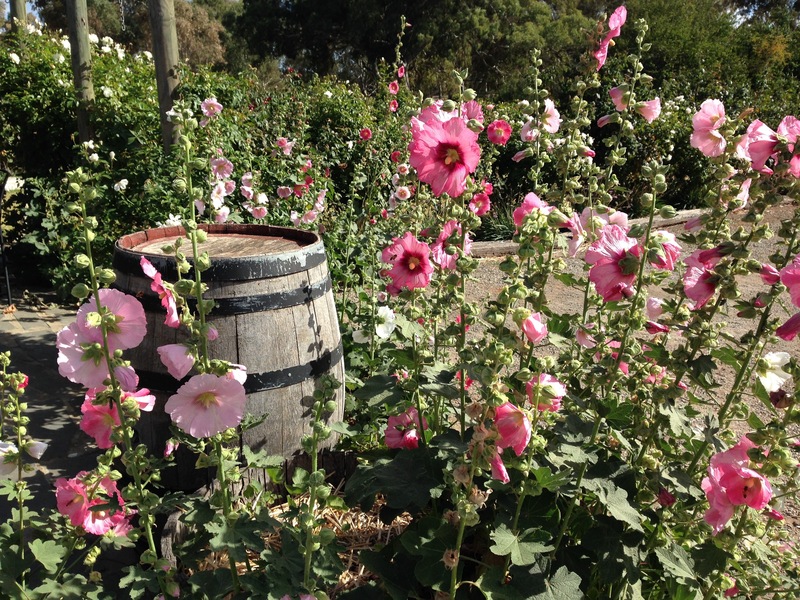 Raw beauty, hardy inhabitants – and awe that those resilient plants thrive. Your words are so true, Kim. I am lucky enough to have travelled remotely in all eight states and territories (if Namadgi counts as remote!) but somehow this trip affected me more than usual. I’m not sure if it was the contrast, coming from green, green Sydney or whether over time I engage with it more and more. But I do so love seeing the ‘real’ Australia. Such a lovely post – S. Australia never fails to impress, especially after the baking heat of summer is over (nothing like frying in near 50C heat to test ones patience for new adventures!) 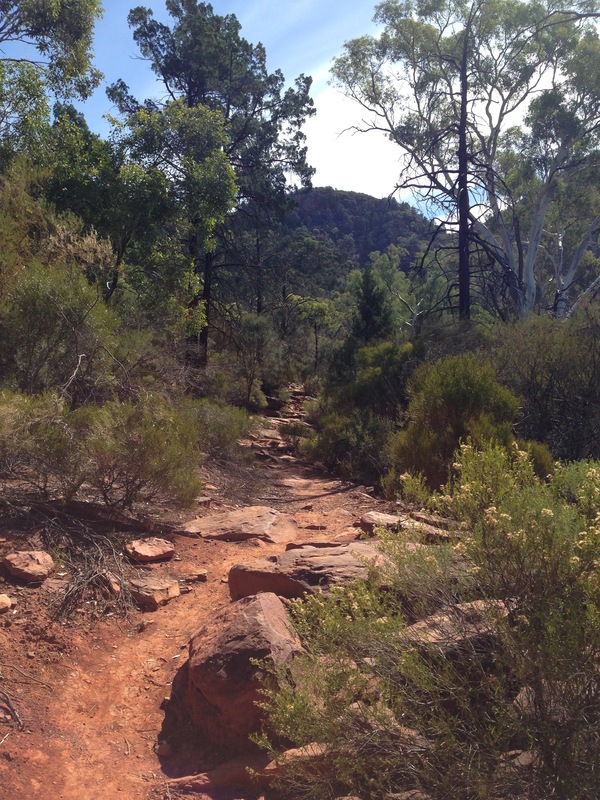 The flinders is a truly magical area and one that I find immensely inspiring. As for the arid lands botanic gardens, well….I don’t imagine I could do much better (or worse, perhaps) with just 200mm of rain! Thanks, Matt. I would definitely have been hopeless in summer; as it was, I struggled on Day 1 and it was only mid twenties. I don’t think I’m used to the dryness, somehow; I’ve always found hot and humid easier than hot and dry, although I seem to be the only person on the planet to do so! You are quite right on the Arid Lands Botanic Gardens, I think it was just the 4.5 rating on TripAdvisor that gave me overly inflated expectations. Good for them for battling on full stop. 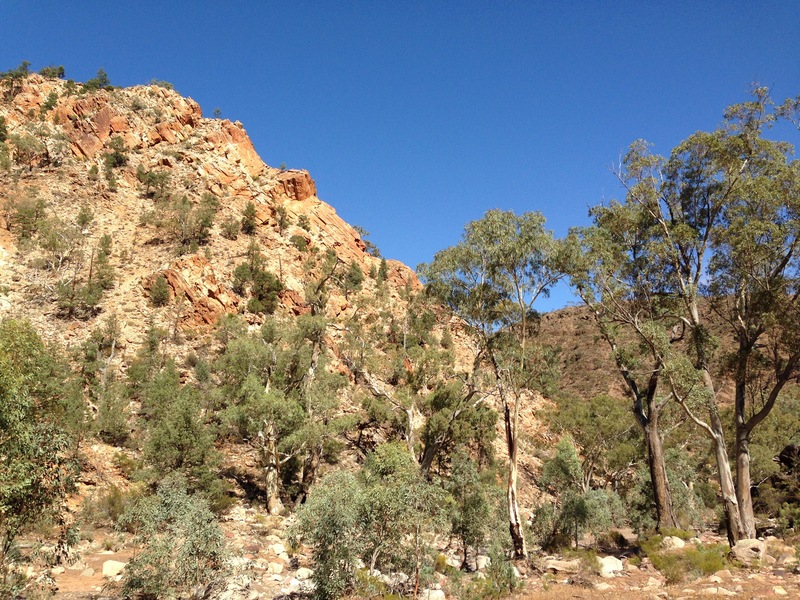 I haven’t been to the Flinders Ranges but we spent a weekend in the Adelaide Hills about 8 years ago. There was a severe drought and the land was just brown dead grass or bare soil. Then we’d see a house with a bright green patch of lawn around it sticking out like a sore thumb. I couldn’t work out what to think – those irrigated lawns didn’t look right in relation to the landscape, (partly because of what they signified, I think – using up precious water) but then I totally understand people wanting a cheering patch of green life amidst all that brown. It was somehow touching. Tough place. I want that stone cottage too, but ideally on a green hill overlooking the sea. On a green hill overlooking the sea…..hmm, Wellington, perhaps?! Bright green lawns in drought are a tricky one. To me they signify someone cares (maybe that’s the ‘touching’ aspect), but I think there are better ways to do that. If I lived in an area that needed irrigation every year to support a lawn, I would rather go without one. But marginal places are a more difficult decision. I read your blog with mixed emotions. It made me laugh but also a little sad. I love the arid interior of this country and don’t find it at all drab or dull…but I understand why you did and many others do. Those dry drab plants will soon be transformed by even just a sprinkling of rain and will be alive with all sorts of wildlife. Their many and varied adaptations add to their attraction, for me. I find the Flinders stunningly beautiful and rich in natural history (although I wouldn’t want to visit in the height of summer). Certainly the best time to visit is during spring when so much more is flowering but, as your camera has shown, there is always something in bloom, like the two eremophilias. I visited the Arid Gardens for the first time about 8 years ago and they were breathtaking beautiful, but drought and insect attack has taken its toll. I know there is redevelopment occuring but growth often is very slow in such low rainfall areas. I was also rather disappointed when I saw them last August but hope to see an improvement when I visit this coming October. Yes we do live in a harsh land but it is so varied and teems with all sorts of wildlife in even the most desolate of areas, if the time is taken to look, and I just love it…warts and all (well..not the feral invaders like goats that contribute to the beautiful red dust cloud you saw!). Hi Suzanne. I’m sorry to make you sad (but very glad you still took the time to comment). I wonder if my post was misleading. There were two things that made the gardens drab to me. One was the terrible light and grey sky; the other, the vast expanses of bare soil. I appreciate there can be some restrictions to plant density in areas like this, but for me, what brings a garden to life is its fullness. A tiny, full garden is much, much better in my eyes than large expanses of mulch with just the occasional plant. The grey skies, well, I’m from England, I detest them with a passion! I’ve put a link above now (just before the post lunch photos) showing how I viewed this part of the world on a sunny day. I am deeply affected by the sun and hope this demonstrates we don’t all find aridness drab. 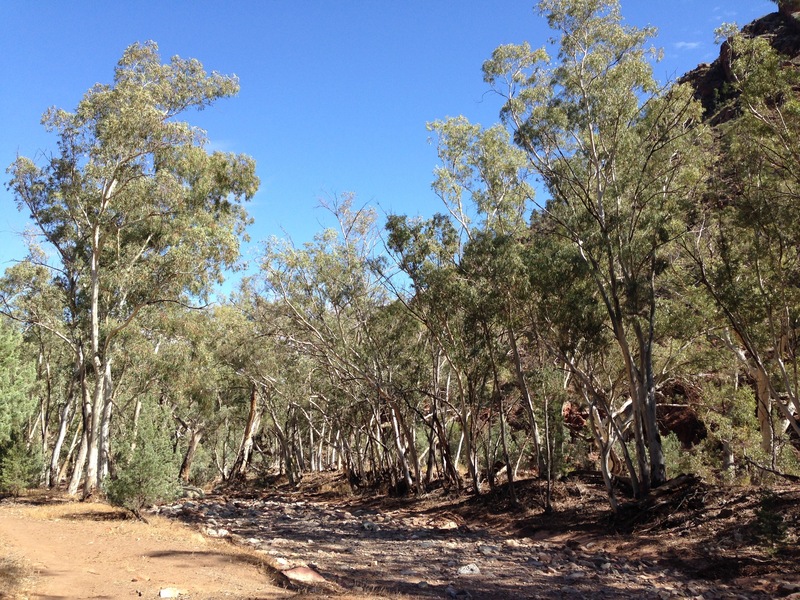 We saw virtually no wildlife in the Flinders Ranges – perhaps a sign of the drought you speak of. 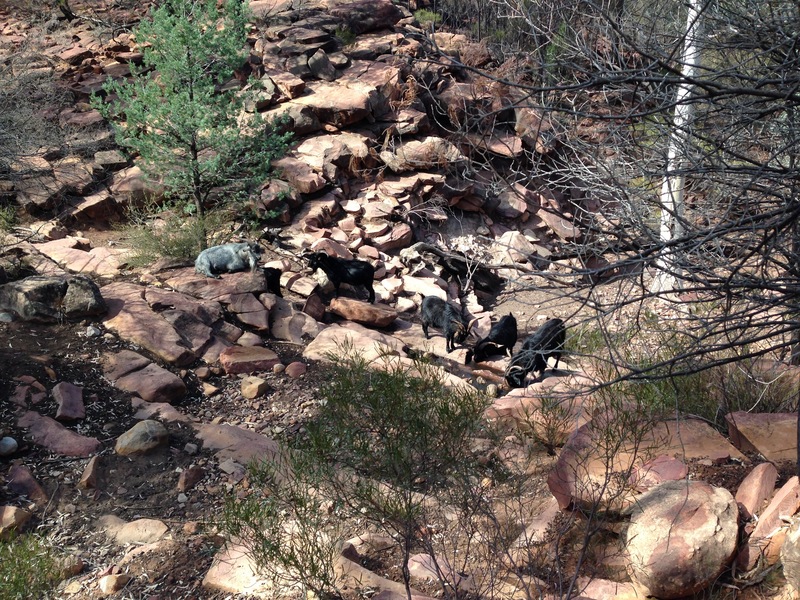 We heard a dingo and saw two kangaroos, but few birds, insects or reptiles. Way less than we have seen walking anywhere else in Australia. I am glad you have seen the Arid Gardens looking stunning – I will make a concerted effort to try and get back there again. Things can’t be turned around over night but the little patches of beauty show just what is possible. Goodness, no need to apologise. I also love green, full gardens but for many of us that just can’t be a reality in any sort of sustainable way. 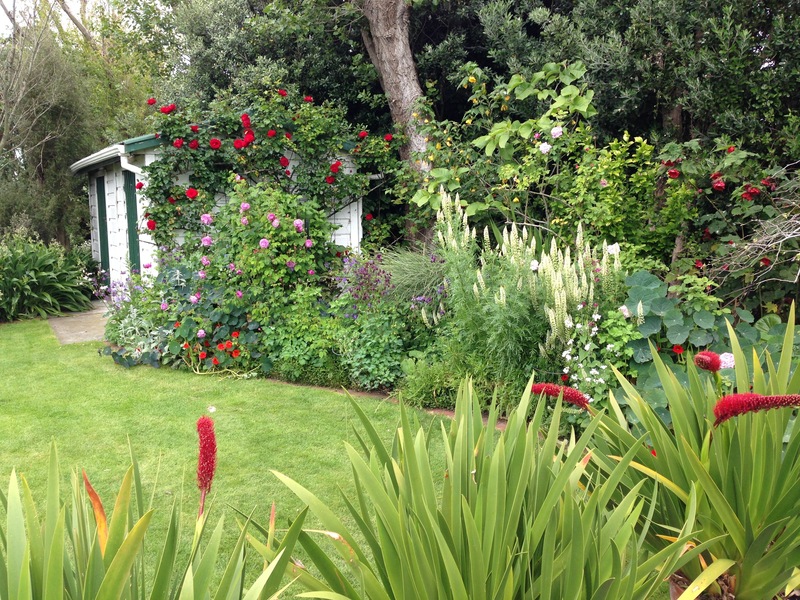 What saddens me is that most Australians (and I include myself) have such a European mind-set of gardens. Dr. Alexander George, a WA botanist, claims that we should view the browns, yellows and grays of summer in the same way as the northern hemisphere views autumn and winter colours. I can accept this totally in the bush BUT still want an oasis for my garden. However, I have limited my lawn to just a small patch ‘out the back’ and use mulch for pathways and voids…and now really do like the look! Viewing wildlife really is a matter of timing, with early morning and spring being the easiest times. 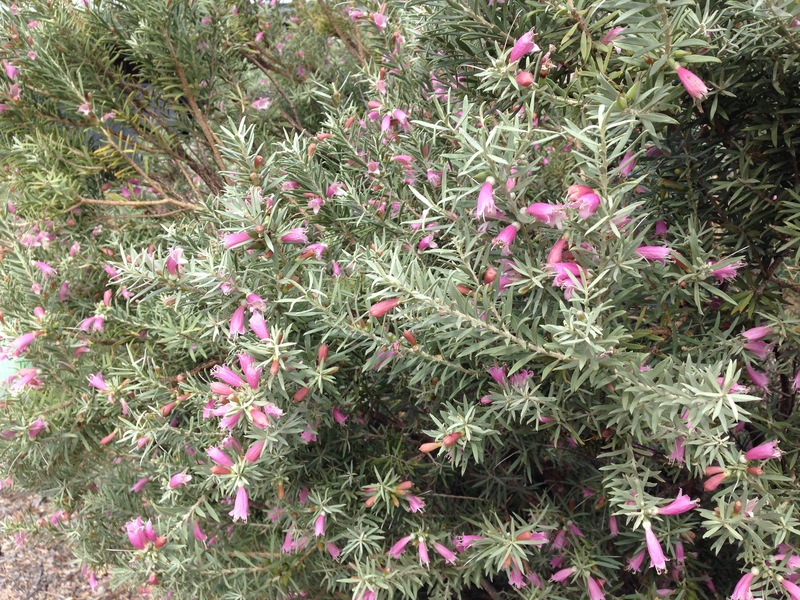 Spotting whats in the bush can become VERY addictive. Alexander George sounds like a very interesting man (with a very interesting career history). I like the concept of thinking of summer as winter; there are many plants that drop leaves/become dormant in summer here and so the analogy works well. You’ve got me thinking! I have fantasies of living in a stone cottage like that in a remote place, but I don’t think I could really manage so well living like that. A 7 hour drive is a long way to travel to work! I loved reading your post, Sue. It’s wonderful to learn more and very interesting to see your photos at a different time of year. I’m not sure we saw any flowers at all although you did remind me of the flies. Mostly not a problem but I was definitely doing the ‘Aussie salute’ for a while on one of the walks! Thanks for sharing the link. It was a bit of a shock to me when I got here and found that I couldn’t plant something, water it in and leave it to grow. Having said that, we’ve had 120mm of rain in the last 24 hours. It’s nothing if not extreme in this country. 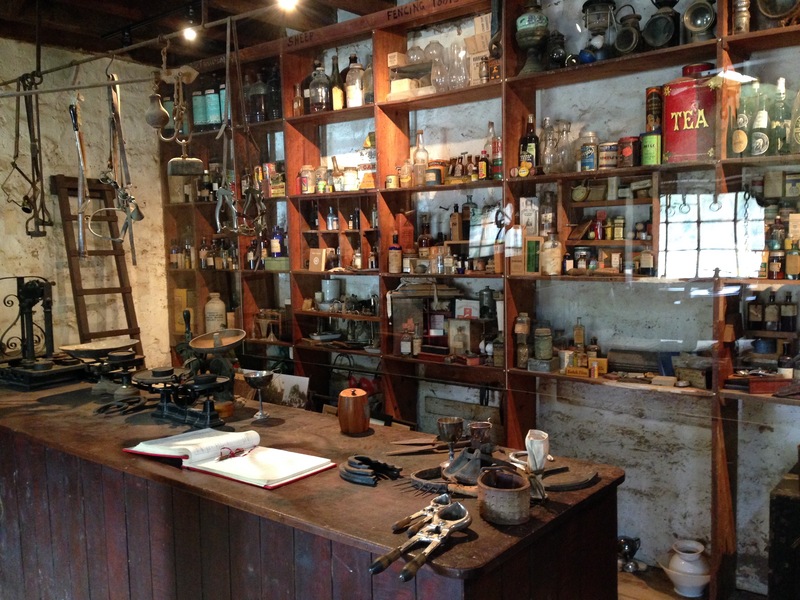 Do come and visit though – look me up in Sydney!